All apartments have a flat-screen TV. A dishwasher is also offered, as well as a coffee machine and a kettle. There is a private bathroom with a hair dryer in every unit. Bed linen is provided. This property is 1 minute walk from the beach. 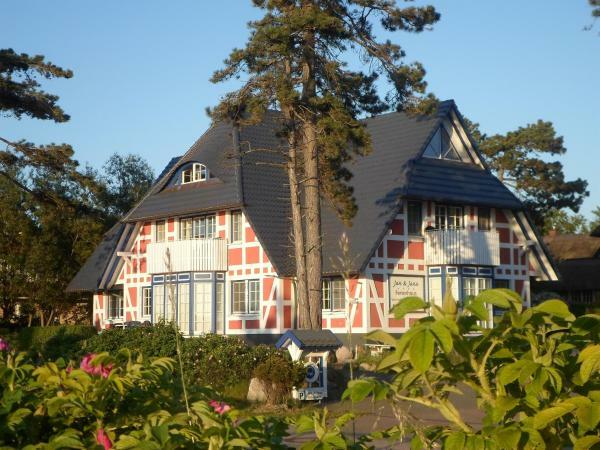 Jan und Jana Ferienhaus is located in Ahrenshoop, 33 km from Warnemünde and 38 km from Rostock. These holiday apartments are allergy-friendly. Guests can enjoy the sauna facilities for an extra fee. Washing machine and dryer can be used for an extra fee. Jan und Jana Ferienhaus also includes barbecue facilities. The property also offers grocery delivery. Stralsund is 45 km from Jan und Jana Ferienhaus, while Zingst is 17 km away. This double room has a electric kettle, sofa and toaster. This apartment features a sofa, barbecue and washing machine. The location overlooking the Baltic Sea is outstanding. Modern but affectionately furnished with a personal touch. Extra towels and additional fresh bed linen can be provided at an extra charge. Please inform Jan und Jana Ferienhaus in advance of your expected arrival time. You can use the Special Requests box when booking, or contact the property directly with the contact details provided in your confirmation. All children under 10 years are charged € 26 per person per night when using existing beds.